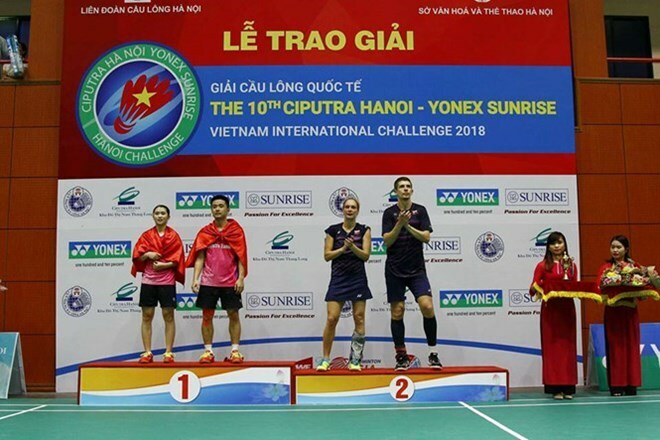 Hanoi (VNA) – Badminton players officially began their competition at the Ciputra Hanoi-Yonex Sunrise Vietnam International Challenge 2019 at the Tay Ho district gymnasium on April 9. The event proves its growing prestige as it drew the participation of 292 players from 18 countries and territories, including Japan, the Republic of Korea, China, Indonesia, Thailand, and Malaysia, which are strong in badminton. On the day, the players competed in the men’s and women’s singles, doubles, and mixed doubles. This year’s competition sees the participation of such experienced players as Heo Kwang-hee of the Republic of Korea, the highest ranked player in the men’s singles, who is the world No 46, Firman Abdul Kholik of Indonesia, No 51, and Vietnam’s top player Nguyen Tien Minh, No. 64 in the world. Vietnamese players compete in all the categories. The event will last until April 14.